On a hill overlooking Nagasaki harbour, U. S. Navy Lieutenant Benjamin Franklin Pinkerton inspects a Japanese house with Goro, a sharp local marriage broker who has arranged for him to have it when he marries Cio-Cio-San. Pinkerton meets Suzuki, who has been hired as the bride's chambermaid. Consul Sharpless is the first to arrive for the ceremony. The carefree Pinkerton explains to him that he has signed a 999-year marriage contract, which he can cancel any time he likes. 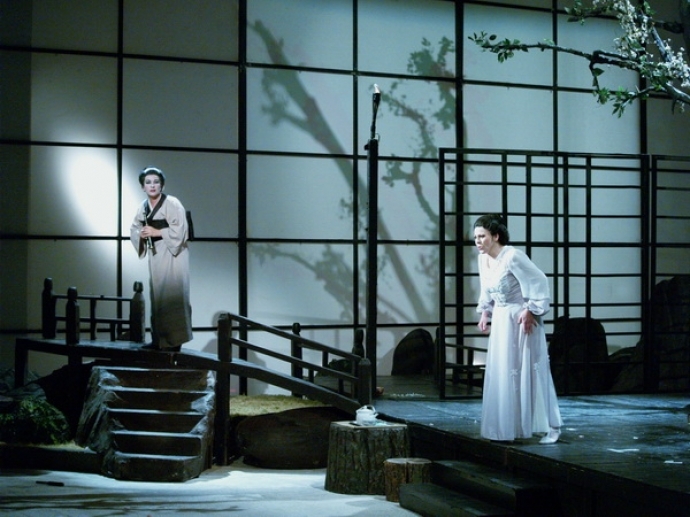 Sharpless feels concern for the Japanese girl, who may take her vows more seriously. The bridal party is approaching, headed by Cio-Cio-San. She greets Pinkerton and the consul and she tells the latter about her background: the family having lost its money, she became a geisha, which she points out is a respectable profession. She turns out to be fifteen years old. When Pinkerton asks Butterfly what she is carrying in her full sleeves, she shows toilet articles, then a sheathed knife, which she does not want to discuss. Goro explains that her father committed hara-kiri on orders from the emperor. The girl tells Pinkerton she visited the consulate to see about adopting his religion. The Commissioner reads the marriage contract, which the parties sign. The party is interrupted by an uncle of Cio-Cio-San's, a bonze, who has found out about her conversion and stirs up the others to denounce her. 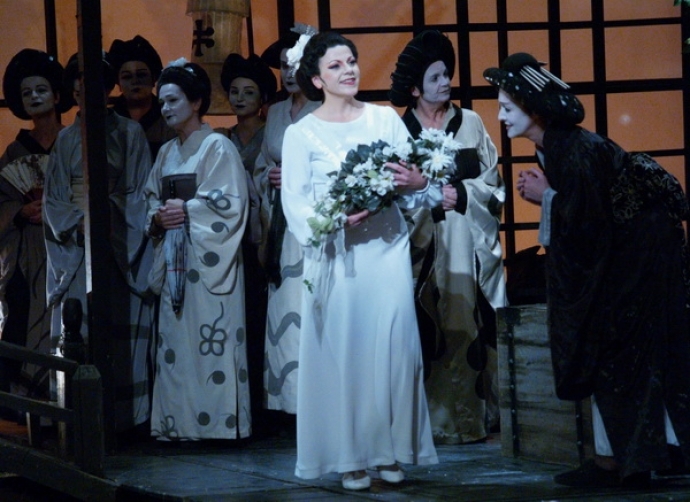 Pinkerton comforts CioCio-San, who calls Suzuki to help her change into her bridal nightgown. As evening falls, Pinkerton speaks lovingly to his bride, and they embrace before entering the house. Three years later in the same house Butterfly is waiting patiently for her husband's return. Suzuki doubts that Pinkerton will come back as he had promised, "when the robins build their nests". Goro appears with Sharpless, who tells Butterfly that Pinkerton has written him, asking him to seek her out. Butterfly is overjoyed. Goro now introduces a suitor, Prince Yamadori, whom she haughtily informs that she is already married. Goro, Yamadori and Sharpless share the information that Pinkerton's ship will soon arrive but he does not want to see Butterfly. Sharpless interrupts reading out the letter to ask Butterfly what she would do if her husband never returned. She could go back to be a geisha, she says - or, better, die. 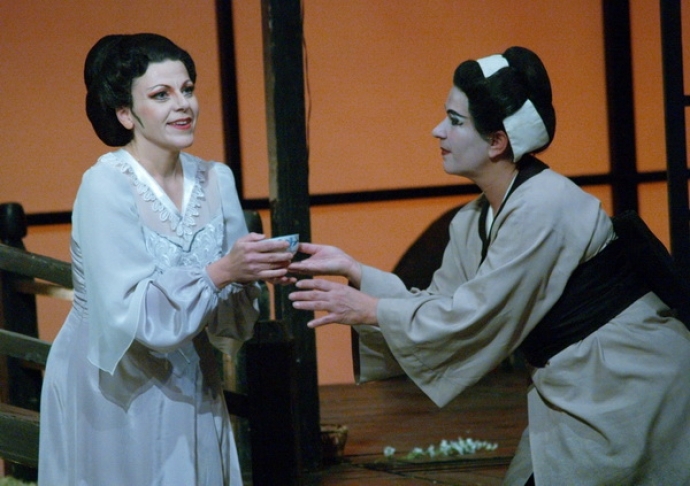 Sharpless advises her to marry Yamadori, at which the indignant Butterfly introduces her son, saying that Pinkerton will surely come when he knows about him. Sharpless leaves without delivering his entire message. A cannon shot is heard; Butterfly recognizes the ship in the harbour as Pinkerton's. Beside herself with joy, she makes Suzuki join her in gathering flowers and strewing them around the house. Once more she has Suzuki bring her bridal gown. The two women and the child sit watching for Pinkerton's return. The exhausted Butterfly goes to her room to sleep for a while with Suzuki's promise to wake her when Pinkerton comes. Scarcely has she gone when Pinkerton arrives accompanied by Sharpless, telling Suzuki not to wake Butterfly Suzuki spots a woman in the garden. Pinkerton's "real American wife". The two men want Suzuki's help in persuading Butterfly to relinquish the child. Distressed by the house full of memories, Pinkerton asks Sharpless to do whatever is necessary for Butterfly and leaves. His wife Kate comes in with Suzuki. Butterfly returns wondering where Pinkerton may be, quickly guessing that Kate is his wife. She says Pinkerton can take his son if he will come for him in person. When the visitors have gone, she takes her father's dagger and is about to stab herself when the child runs in unexpectedly. She embraces him in an impassioned farewell and sends him to play with an American flag. She kills herself with the knife behind a screen. Dragging herself back to embrace her son, she dies as the distraught Pinkerton, Galling her name, returns with Sharpless.